„Seth Godin may be the ultimate entrepreneur for the Information Age,” Mary Kuntz has written in Business Week nearly a decade ago. „Instead of widgets or car parts, he specializes in ideas—usually, but not always, his own.” In fact, he’s as focused on spreading ideas as he is on the ideas themselves. After working as a software brand manager in the mid-1980s, Godin started Yoyodyne, which Yahoo! acquired in late 1998, one of the first Internet-based direct-marketing firms, with the notion that companies needed to rethink how they reached customers. His efforts caught the attention of Yahoo!, which bought the company in 1998 and kept Godin on as a vice president of permission marketing. Godin has produced several critically acclaimed and attention-grabbing books, including Permission Marketing, All Marketers Are Liars, and Purple Cow (which was distributed in a milk carton). In 2005, Godin founded Squidoo.com, a Web site where users can share links and information about an idea or topic important to them. 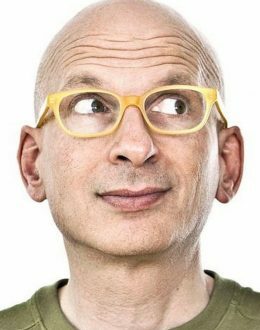 Seth Godin is the author of fourteen books translated into more than 35 languages. All bestsellers. He writes about the post-industrial revolution, spreading ideas, marketing, quitting, leadership and most importantly, moving ahead and changing. American Way Magazine calls him, „America’s Greatest Marketer,” and his blog is perhaps the most popular in whole world written by only an individual. In one of his latest books, „We Are All Weird”, writes about ending the usual mass and bringing people more choices, more interests and more space to control and reflect their own unique values, and once again Seth breaks the usual model of publishing by releasing it through The Domino Project. His recent Kickstarter for The Icarus Deception, published in January 2013, broke records for its size and the speed that it reached its goal. As an entrepreneur, he has founded a lot of companies, most of which failed. Squidoo.com,was ranked among the top 125 sites in the US (by traffic) by Quantcast. It allows anyone to build a webpage in any topic of your passion. In 2014 Squidoo was acquired byHubPages. Seth is a renowned speaker, who is consistently rated among the very best speakers by the audiences he addresses. He holds an MBA from Stanford.